The worst nightmare of ophidiophobes—people with a phobia of snakes—may have just been realized. Scientists have captured footage of “flying” snakes, explaining how five related snake species stay airborne for up to 79 feet. 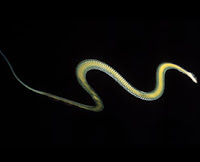 The acrobatic arboreal snakes, all in the genus Chrysopelea, use what's known as gliding flight to sail from tree to tree in their Southeast and South Asia habitats. The new research, presented by the American Physical Society Division of Fluid Dynamics, explains how the snakes accomplish their seemingly improbable feat.